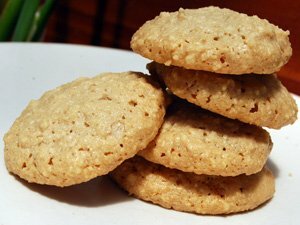 Here’s a recipe for Italian Almond Cookies that’s super simple, and tastes wonderful. Italian names are Brutti Ma Buoni, which means “ugly, but good,” or Brutti E Buoni which means ugly and good. They’re a type of almond macaroon. When they first cool, they are slightly crisp on the outside, but soft and chewy inside. They lose a little of the crispiness and become more chewy when stored, but they’re still great. 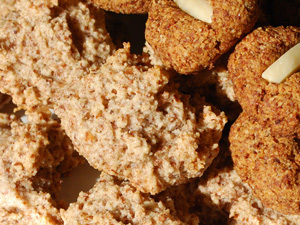 One reference reported that brutti ma buoni include chopped hazelnuts and are crisp. Ricciarelli are a variation that are oval shaped and typically sprinkled with powdered sugar. I think the reason these Italian almond cookies are called “ugly but good” is they are drop cookies and have irregular shapes, unlike amaretti and similar traditional Italian cookies that have perfect shapes. I adapted this gluten free cookie recipe from one of my favorite Italian cookbooks: Essentials of Classic Italian Cooking, by Marcella Hazan. Read comments below, and if you try this almond cookie recipe, please let us know how you liked the cookies. Preheat the oven to 300º, and line a baking sheet with parchment paper. Or grease the baking sheet well. Since these don’t have any added fat, they tend to stick. I love using the parchment paper: they come off easily and cleanup is really easy. Mix together the almond flour and sugar, pressing out lumps. A rubber spatula works great. In a separate bowl, beat the egg white, vanilla, and salt with an electric mixer until it forms soft peaks. This is pretty quick. Fold the egg white mixture into the almond/sugar mixture. Drop by heaping tablespoonfuls onto the lined or greased baking sheet. They will spread some so be sure to leave about 2 inches between them. Bake for 30 minutes. If you don’t have an oven thermometer, and aren’t sure if the oven temperature is accurate, set your timer for 20 minutes. If they are getting brown the oven is too hot, and they’ll need less time. Remove the Italian almond cookies from baking sheets to a wire rack to cool. If you want a light textured and light colored cookie as seen in the image above, Honeyville sells the most finely ground and best priced blanched almond flour I’ve found. The fine grind makes for a smoother, lighter result. Read my blanched almond flour review here. If you’re like me and not a purist, and don’t mind wavering from tradition, you can vary the recipe. This is available from Honeyville as “natural almond flour”, and from Trader Joe’s. It will give you a completely different texture, as pictured, because the almond skins soak up moisture from the eggs. They’ll be much more irregular, and perhaps more in keeping with their “ugly” reputation... If you like the idea of using natural, unblanched almond flour and you want to experiment, you could try mixing in a little water or oil to smooth them. And let us know how they come out! Both types of Italian almond cookies I have pictured here were made with unblanched almond flour. The lighter colored ones are made with sugar, the darker ones with date sugar and rolled into balls. Decreasing the amount of sugar, or using a different type of sweetener will also result in a different cookie. I can’t eat sugar, but I love these made with date sugar, which is just dried ground dates. They’re not exactly low carb, but aren’t nearly as sweet, and I’m OK if I only eat a couple. I love these! Note: the date sugar cookies in the picture are only smooth because I rolled them into balls and flattened them. Otherwise they would really be ugly! I’ve also made some by replacing the sugar with 10 drops of stevia: they are much more compact and chewy. They taste incredible, and have absolutely no sugar spike. So they are great for diabetics. Be sure to use the Clear Stevia™ from NuNaturals : It’s a relatively new product without that bitter stevia aftertaste. I haven’t tried the powdered form yet.